Imagine my constant surprise, seven years later, at how much still remains unsaid about doing a thesis – even about the basics, such as how to get into a PhD program. Consider this letter which, eerily, happened to land in my inbox just as I was preparing my pitch for prospective students for ANU Open Day this coming weekend. Long-time reader, first time contacting you. I am just getting my bits and bobs finalised to apply for entry into a PhD at (an Australian University) as a mature-ish age (36) student. I have found the application process in itself daunting! I think it’s the first test. I wonder whether you would consider a post about the entry requirements/proposal as I have found your site invaluable even though I’m yet to enrol! The application form itself, is entirely geared towards students coming straight through without having had a career first, which is quite off-putting for those of us who undertook an undergrad years ago without concern of the GPA. I am assuming many like me, have no access to university library resources (given we’re out in the non-academic workforce) and whilst potential supervisors are great, they can’t be relied upon for doing all the groundwork. There’s not a lot of guidance about what the university expects this proposal to look like, how complete it is, how much weight is placed on it when considering your application, how much you’re held to it over the candidature etc. For example I am assuming my approach to evolve once I’ve been able to undertake a literature review, which I can only do once I’ve gained entry! First I want to validate your experience by saying you are not alone. For those coming straight from an undergraduate, masters or honours degree, the process can be quite straightforward. However, the older you get, the harder it seems to be. Given that the average age on entry to a PhD in Australia is 32, you’d think that universities would take this into account, but sadly many don’t. 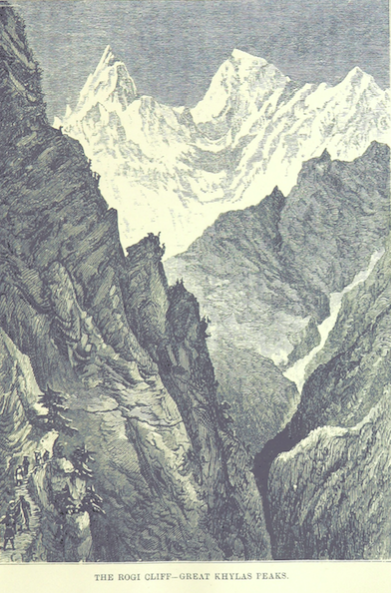 Etching of the Himalayas from the British LIbrary Collection. I’ve helped several friends and relatives through the process of getting into a research degree and every time the process was complicated, protracted and confusing. Most people need a mountain guide to the academic Himalayas … Every year at ANU Open Day I distill this advice into a presentation for prospective students. This presentation doesn’t isn’t just for prospective ANU students, it’s advice I’d give anyone trying to get into an Australian University. The advice may also have relevance for other places around the world (your mileage may vary of course). Reading between the lines I assume you already have a supervisor in mind. That’s good. The supervisor is the first and most important piece of the puzzle. Finding a supervisor that is interested in your project and willing to give you the support you need is vital – and challenging. Some people, like me, don’t actually want too much supervision. They have a clear idea of what they want to do and the skills to achieve it. To people like this, a supervisor is a cheer squad. Look for someone who is good with pom poms and happy to let you have your way. I’ve observed in my ten years of being a research educator that highly experienced, successful researchers are often a good fit for your more independent student. They have less time to commit, but can share valuable networks and resources. Other people need a supervisor willing to give them hands on support. A student like this needs a lot of time from a supervisor – so they need someone who wants to ride shotgun, not sit in the back seat. In my experience, early career researchers are often better at playing this role. Early career academics tend to be in touch with the latest ideas and keen to form relationships and further their career (a good early career researcher knows that students are an excellent way to extend a professional network). Importantly, early career researchers might have large teaching loads, but they likely to have less of the tedious management responsibilities that mid to late career academics have to deal with. The best idea, of course, is to have one of each type of supervisor on your panel – that way you have the benefit of freshness and experience. Access to papers and journal articles that are behind paywalls is deeply frustrating. There are, however, a number of ways around this problem. Google scholar is a good all round search engine you can access from home. It doesn’t have everything, but it’s good enough for your purposes. Have a good hunt through it for a couple of hours and make a list of papers to follow up (keep an electronic record in something like Evernote – writing down all the details is very tedious and you might miss a comma or date that is import). Citation searches are the most powerful weapon in your literature review arsenal. If you want to learn more about citation searches, you’re in the right place. Libraries are full of helpful librarians, who can guide you further into the dark arts of specialist databases. I’ve never yet had one of these helpful creatures ask me for a student card before helping me – but if they do, explain your situation as a prospective PhD student of the university. I’m sure this will be enough to get them to help you. A half hour with a great librarian can save you SO much time. The very best way to get a sense of what is expected in a research proposal is to look at some. Unfortunately, they are not the sort of documents that people tend to make public. In the spirit of openness, this is the proposal I submitted which helped me gain entry to the PhD program at the University of Melbourne. This tells you two things: it might not actually matter that much in the selection process and it doesn’t necessarily lock you into anything. This is not the case in all disciplines, especially the sciences which tend to have funding in place for particular problems. But it does tell you that a good effort, which addresses all the basic categories, might be sufficient (I can’t say for sure, as departments can vary so much). To be honest with you, the process is much more likely to be driven by numbers than the proposal. This is a problem for you if you don’t have the numbers. If you are close to getting in on the numbers, having an academic publishing record – even if it’s only one paper – can help you over the line. A publishing record is probably a 5% advantage in getting a scholarship under most schemes (but that’s a whole other post for another time). References from academics who can vouch for your competence can do wonders – if they are the right people (I had one from a Dean of Higher Degree by Research which was like a magic spell). Some people (like myself) have bad numbers but are still good candidates. This can be for a variety of reasons. You might have had periods where you were a ‘bad student’ and didn’t get great GPAs. Or you might have done a degree which is now defunct and no-one can work out equivalence. There are a number of ways around this problem, but it can be tricky and you will probably need some insider help. Sometimes it just takes a letter from the supervisor explaining the situation, or you can try enrolling in a ‘lower degree’ with the intention to apply for a transfer to a PhD. Be careful – not all masters degrees in Australia are considered equal. Make sure the one you choose has a substantial research component. I ended up taking the MPhil to PhD route as, despite being awarded honours for my GPA, my overall undergraduate transcript was woeful (I was very distracted by beer and boys in my early twenties ok?). In the end I decided to finish the Masters and then apply for a PhD at another university. The road can be long for some of us! I wish you luck on your journey. I’d be really keen to hear from regular readers – what did you learn about the process that you think might help Potential with her problem? I’d like to hear more about the process in other countries too – no doubt future readers hitting this post will be looking for different answers. What did you learn on the way into your degree? Was it smooth, or did you have to take some detours? I’d love to hear your story. You are not alone! I’m 40 and it’s been years since I finished my last degree. I’m now just 2 months in and found the experience of applying challenging and a bit demoralising. My faculty provided no guidance on what to submit to them. I was lucky to find a half day course run by the uni Learning Centre on how to write a PhD proposal or I would have been really lost. In the end I was accepted to do an MPhil (since my previous Masters was by coursework) and I’ll attempt to upgrade to a PhD next year. My uni allows limited library access to allumni for a small annual fee as well as having public access terminals in the actual library. Great read! From my experience in Portugal when you’re applying to an individual scholarship from the National Foundation for Science and Technology it also works like this, the grades are a general barrier but it has the same weight as the project itself. Now it even becomes more difficult for non-academic people to apply because previous publication experience gives more bonus. Another way to get scholarships is to apply to a PhD program (like I did) where of course the grades matter and your letter of intentions about a prospective project too, but they also interview you for the positions. This latter approach I think is better because it also helps to determine the adequacy of the person to the program not only based on numbers. Also good to know that public libraries in Australia offer access to a limited number of academic papers. Here our public libraries do not offer such service, it’s a good idea! Good luck to “Potential” on his/her PhD application! I talked to my prospective supervisor first and she helped me with the proposal – it had already gone through a number of drafts with her before I submitted it. This is one benefit of going with an early career supervisor – I was her first doctoral student so she was very keen to get me over the line for my application. However, she had already sat on a number of PhD panels, so she had already seen plenty of proposals. Thanks Thesis Whisperer and Potential for your post. I agree with much of what you said and it is similar to my own experience. My journey as a 45 year old clinical researcher has been interesting and challenging. I started as a part-time MPhil as I hadn’t done honours 20 years earlier when I completed my Bachelor’s degree and being a parent of three I wasn’t sure how the juggle would all pan out. Navigating the University website and application form required a PhD in persistence. Being part-time and a Master’s student ruled me out from most scholarships. Even when I converted to full-time study and a PhD I have found the scholarship application process so competitive that I continue to be self-funded thanks to part-time work, a generous boss and a partner who understands that I won’t be bringing in the big $$$. Higher degrees and funded scholarships are definitely skewed towards younger students…there are no points for life or work experience…even if you have been in the research field for years! I returned to study because I wanted a challenge and wanted to be able to gain formal recognition in the research field I am involved in. I am certainly on the path to gaining these things but nothing is transparent in this process…lots of people offer advice (most of which is based on assumptions rather than actual fact!). You need a tough skin and be ready for many more rejections than successes! This is such a great asset Thesis Whisperer and I have been an avid reader sine you began. Just wanted to add my two bobs worth. Having done a research MFA straight out of an Hons degree – I was ill prepared and spend a good 12 months finding and narrowing my topic and research questions, which were still not resolved up until 6 months prior to finishing. This was mainly due to me finding new areas of international research that my supervisors had no knowledge of – so I couldn’t get good critical feedback . When I did my PhD, some 5 years later, I had read publications, attended conferences and spoke to potential supervisors in Aus and overseas broadly about my areas of interest so that when I did start, I had a massive load of knowledge under my belt. The first 12 months up to confirmation, while never smooth, was a rich and rewarding experience refining and recognising the valuable bits of that knowledge I gained before I started. This enabled me to nail some rigorous research questions nice and early and allowed me to structure a solid research plan for the next 2 years of the candidature. I was lucky enough to work with a university on their PhD enrolment conduction and completion processes recently (last month). I am glad to say that this issue (enrolment of older students and the continuity of the learning from undergraduate to post-graduate) was raised as a barrier to completing the PhD. So, I can at least say that it is “on the radar” and greater support (such as info sessions and days, as well as supervisor guidance) during the application process was the proposed solution, as well as consideration of alternative entry requirements. I’ve also sent this article to them as further evidence of the value of the track they have taken. It is really good blog. I would like to add the situation could be really daunting for international students in similar situation like you (me too) with bad numbers, non-acdemic background but only work experience and passion to contribute to knowledge and society. Figure out if academics or administrative staff will read your proposal – the first time I applied I wrote a very detailed proposal about my future research and was accepted into the PhD, but missed out on a scholarship. The next time I talked myself up so much I felt stupid (on advice of several academics)- I also wrote about what great facilities the uni had for my project. Suddenly I was accepted with a great scholarship for the exact same project at the same uni. My GPA wasn’t that great, but I’d done a research masters after undergrad. Mention your skills over your previous grades, some of the selection process is to do with your potential research ability rather than just grades. One source for sample dissertation proposals is http://www.ut-ie.com/s/sample_diss.html. These are all from US and would probably have been written after admission to a program and an initial coursework phase, so they may differ substantially from the proposals that PhD applicants are expected to write as part of the application process. So these samples may not apply directly to Potential PhD student at present, but could be useful to some readers. There is a nice mix across disciplines. Wow. Thank you for this post, and thank you for sharing your proposal! I’m surprised how the Australian PhD program application is more similar to the European than the US application. The US application does not require this proposal. process is quite different. You begin on your thesis straight away, so you have to have a proposal for that ready before admission. Yes, same in Germany. That makes it a struggle for students in the US to study abroad, because they often feel completely unprepared to start right away; they are used to the warm-up process in the US. This is really a nice article for anyone like me who have the intention of pursuing our Phd program. I got alot to learn from the post. Am done with my masters program, and will like to gain a schorlaship abroad for Phd. In Australia, State Libraries are a great resource, not only for books but also for access to databases, and membership is generally free. I found the State Library of Victoria’s resources incredibly useful when I was preparing my MA proposal. I had a terrifying hiccup in my PhD application process that I thought I’d share. I applied for just one (Australian) university, because I wanted to do my PhD with the head of my field (ambitious, but it worked out). I emailed him with some topic ideas, referenced meeting him at a conference, and he emailed back and said that sounded good if I could find a second supervisor. I then submitted my application feeling confident – this guy had said my topic proposal was good, so I must get in! I had good references and good grades, and some conference presentations and a database publication from some time as a research assistant. And then I got an email from the university saying that my topic wasn’t within the remit of the department I was applying to. Cue panic attack at my local library, because I didn’t have a backup plan! I called the department once I was calm and explained that this mega-academic, who was also associate dean of the department, had said he’d supervise me. She got me to forward her the email and I was eventually accepted based on that, which gave me the ability to find a second supervisor (happily I ended up with someone only a couple of years out of his own PhD, so I have the best of both worlds referred to above). I guess the point is to think strategically about how you pitch your proposal to your department. The department I’m in now does batching for PhD proposals – they collect them all, and every six months go through them in a big staff meeting and assign supervisors to the good ones – so the process has changed, but when I applied, even though my topic was right up the mega-academic’s research alley (which is how I’d pitched it), it wasn’t particularly relevant to the department (hooray for cross-disciplinary social sciences). And always make friends with the admin. That woman really saved me. This is all great advice, Inger, but sadly, as someone has said above, not all Uni libraries have public access terminals. You will often have to log in with local ID to even see the catalogue (this is the case at Sydney). In fact, at least one Uni in Sydney has installed readers at the entrance to the library, so that no one can even enter the building unless they have a Uni ID/library card. I think that state libraries would be the only place that many students would be able to get access to material to write their proposal, and that would be limited. It’s a real problem for mature students who aren’t already employed at or somehow connected to a Uni. Thank you for sharing. I agree with you, the grad school application process seems to be designed for people who are currently in school. I was 39 when I applied, and found the application process to be relatively straightforward because my program (at a Canadian university) only required a letter of intent, and not a full proposal. However, the process of getting my research funded was much more difficult. The application process for the most lucrative government funding programs begins a full year in advance, and it does indeed require a detailed proposal. Plus, the students targeted for “strategic recruiting” scholarships (from my observation) were generally students studying at distant universities. So, yes, I believe returning students are at a definite disadvantage when it comes to being awarded scholarships. However, I have found no shortage of interest among professors looking for an experienced teaching assistant (TA). I wasn’t the kind of student the program was actively recruiting, but once I was on campus they were happy to take advantage of my skills and knowledge. A lot of the discussion has been about accessing library resources. It is a shame that so many university libraries make it difficult for non-students. My own undergraduate university provides its alumni with a library ID for life – it can even be used on line. I had no idea how special this privilege was until now. One other thing – when selecting a supervisor, if you would like to have lots of academic guidance but still be treated like an experienced professional in your field, be careful to choose a prof who is comfortable with a less hierarchical student-prof relationship. Potentially, this might be a professor who has, like you, worked outside of academia for a while. All best luck to Potential. The first thing I would advise is to contact the potential supervisor or the head of department – if you are not sure who the supervisor would be. wow, i thought the application process was difficult enough, & i only needed a statement of intent as well. coming up with a research proposal right off the bat, just to gain admission? yikes. Perhaps things are a bit different in Australia, but what I would advise prospective arts / humanities PhD students in the UK is to look for PhDs around already funded projects rather than only apply for programmes where you pitch your own project. A lot of the time these projects are a little over-specific and in slightly more obscure areas, but if you find one that matches your interests they have many advantages. For example, the grant that I have is part of a set of 5 the department got for inter-related projects and I really like the fact that there’s so many other people working on similar issues who are all at the same stage in their project, it really helps encourage feedback and collaboration. In the department I did my MA in, my project was quite different from what everyone else was working on and I felt like I didn’t really get enough feedback on my work from people familiar with my area. Also these kinds of projects often have only a handful of applicants so it can be easier to get in (I know of projects that didn’t get any applicants!). Not to mention that having the project description as a guideline to build your proposal around makes writing the proposal a lot less stressful than having to come up with everything from scratch. Hmm. This is very different than my experience here in the US. I was 32 when I went to apply to a PhD program. I’d been out of school for 7 years. I got both my Masters & PhD in programs that are considered more professional programs – people often work while getting degrees in Instructional Technology here in the states. Our masters programs also tend not to be research based. I was one of the few students who came in knowing what to expect about writing, etc.. My process was that I reached out to professors from my Masters program and got recommendations for programs, then I researched all the professors at those programs, narrowing it down to professors I wanted to work with. I then wrote my candidate statement for each uni I applied for with those profs in mind. I did horrible on the GRE, but everything else was okay – they realized I was a good candidate even with bad standardized test scores. I guess I”m different – I didn’t find the process all that daunting.. PhD school was far more daunting. I’m grateful I did it and 3 years out of finishing and I’m still wicked proud of myself for getting the darn degree. From the actual beginning with the game Bright Wizards stood a ridiculous mix of damage (greatest inside the game), crowd control, utility, and escape abilities. The Nerf Maverick is one in the most popular Nerf guns to date. Fire gloves 40 Runecrafting75 tokens Chaos gloves 50 Runecrafting150 tokens Death gloves 92 Runecrafting200 tokens Blood gloves 94 Runecrafting200 tokens. Minecraft Strategy: How to Make Giants in Minecraft. University libraries: access depends, indeed: in the Netherlands, you can often get (pay for) a uni library card without needing to be a registered student and get access to most/all of the facilities, while in the UK even alumni have difficulty accessing them. Public libraries may not have up-to-date research material available, but especially in university cities they may have students working there (I did during my BA/MA degree, and several of my colleagues were students at well), who may be able to help you beyond what the library would normally offer. In my experience, too, proposals are in no way set in stone – it’s more important to show that you have spent some time thinking about your potential project and its implications. That this may change as you go on is generally understood. However, that doesn’t mean the proposal isn’t important: it’s your way of displaying your skills and engagement with the topic as well as your critical thinking/writing skills more generally. Especially if you have to prove your language/writing skills (e.g. if you’re moving across language borders, as I did from Dutch to English), a well-written proposal is your advertising platform for this, too. One way of getting insider info is to approach the postgraduate administration and/or your potential supervisor and ask if they can connect you with some of the university’s current PhD students (either from the same supervisor or just in the same department/general area – many will have PhD representatives or something of the like, who won’t mind a couple of extra emails). Current PhD students will understand what you’re going through but will also have the inside viewpoint, so their comments can be massively helpful (I emailed back and forth before starting with a couple of PhDs supervised by the person who became my supervisor as well, and in turn I also emailed with potential students of hers during my PhD – I never minded doing so). These students may even be willing to share the proposals that got them in, giving you an even clearer idea of what to do about it. The topic sparking this post sounded as if it was for a non-funded place – if you’re applying for a funded programme, there may be additional demands (but, the advantage is that they are usually clearer/written down somewhere). When applying for funding, it’s even more important to familiarise yourself with the topic and the university as well as the requirements of the funding programme – you don’t want to find out on the final day of submission that you actually need three references instead of two, or silly things like that. Long piece, but hopefully some helpful additions. Good luck to all! Web site in your computer and select more Roku channels. 3 rca to hdmi cable You will observe that none with the documentation or product information online mentions Bluetooth capability. Yamaha YSP2200, but connectivity may be taken into consideration too. taken drones to places which can be harder to reach. The likelihood of someone breaking to your wireless network can be quite low. people use search engines like google to aid them go directly. Top rated wifi extender 2015 There is often a separate swimming pool area available for adults and children. surveillance cameras. Two speakers might be found around the right side, with another for the left. Such style of Devices can be employed for police work by enforcement, creating it better to enforce the reassurance of common areas. the property of Raspberry Pi Foundation. greatly enhance the color accuracy of your respective pictures. receiver where it really is decoded into multichannel sound. about another LCD with this dimension. You also need to look after the quality of your respective ad to guarantee its success. This app is restricted to NPR content, but that does not mean it isn’t full-featured. than FRS and you don’t need to obtain a license. independently, tired in the drug route and never wanting surgery. BUT, the decision as to which radio is best for you requires cautious consideration. Thank you for providing a link to a research proposal!